The son of this man gave one of the best speeches to graduating high school seniors we’ve ever heard. Do you know who this man is? Photo credit: Pete from USA. 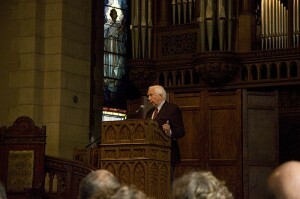 We salute David McCullough, Jr. for this very special speech! It never ceases to amaze us how many parents (and how many students) think they’re special. They think they’ll get into Harvard just because they deserve to get into Harvard. Over the years, we’ve been on thousands of phone calls in which mothers and fathers talk our ears off about how special their kid is. Because he plays soccer and the violin. Or because he’s just so, so smart. Or because she’s so involved in community service. If parents only knew — the last thing we want to hear about is how special their child is! And that’s because what parents see as special isn’t necessarily special in the highly selective college admissions process. Just because your child is so “bright” and “charming,” that doesn’t mean they’re brighter or more charming than other applicants. It pains us how special some parents and students think they are. It would be a whole lot easier if these parents and students just accepted right off the bat that they’re not special, that to gain admission to a highly selective college, they’re going to have to take our advice to make themselves more special. The students and parents whom we work with typically come around and understand the fact that they or their children aren’t special but it would be a whole lot easier if they knew this upfront. As Mr. McCullough states so well, there are thousands of valedictorians. There are thousands of jocks. Thousands of musicians. In fact, Mr. McCullough says, “Across the country no fewer than 3.2 million seniors are graduating about now from more than 37,000 high schools. That’s 37,000 valedictorians… 37,000 class presidents…92,000 harmonizing altos…340,000 swaggering jocks…2,185,967 pairs of Uggs.” Not everyone is special. Few are. If everyone were special, special wouldn’t mean anything. Seriously. While you’re here, check out this “Huffington Post” article on Ivy League admission.